"Who knows who Jim Carrey is?" "Okay, did you know this? 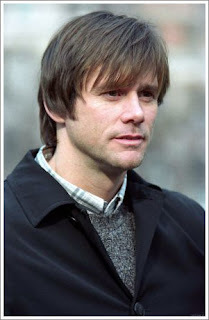 That when Jim Carrey was a little boy he was terribly shy? That when his parents couldn't pay for their house anymore, the family moved into their car and he didn't have any friends?" No, they did not know that. "How about Abraham Lincoln? Ever hear of him? Or Thomas Edison?" "What about Tom Cruise, Julia Roberts or Brad Pitt? Has anyone here seen 'Star Wars'?" "Harrison Ford played Han Solo...remember him?" "Here's the truth: All of these people are shy. Thomas Edison wanted very badly to be a Shakespearean actor but he was too shy to go onstage....Luckily for us he put his talents into inventing the light bulb so we can read our scripts. Many huge stars are shy but they still get up and act in front of thousands. Know why?" "Here's the secret: When you are onstage, under warm lights, with a great story and big fat language, you are in the safest place in the world. No one can touch you. You have all the power and all those people have to sit up and listen to you." "Does Jim Carrey have any friends now?" "Way more than he needs, I think." We all sit for a moment and ponder shy people, many of whom are in this room. "You know how we do yoga to stretch our bodies? And we write in our journals to stretch our imaginations? We also have to stretch our courage...so, when I ask if anyone would like to stand and share their journal writing, please consider taking a chance and finding the brave part of you. Here, in Room 42, we are in a safe place....It's time to take a chance." I wish you could see the squinting mistrust looking back at me. I want to be in the Shakespeare Club because I want to get over my shyness. Also because I want to feel what an actor feels. Another reason is because Shakespeare is coming to be interest to me. Also because shakespeare is starting to inspire me. What I learned about William Shakespeare is when he was born. He was born April 23, 1564. I also learned how he grew. He had to go to school at 6:00 in the morning and head out at 7:00 pm when it was nearly dark. Also I learned when he died. He died April 23, 1564 exactly on his birthday. That's what I learned today in the first day of Shakespeare.